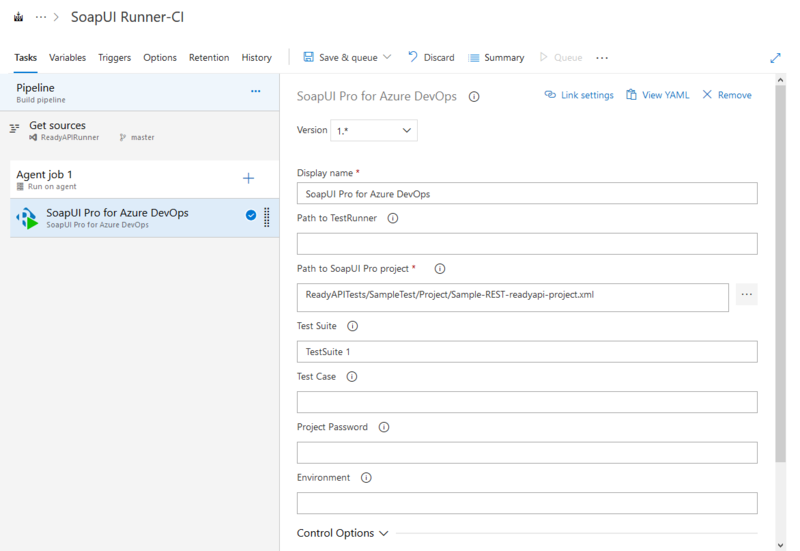 You can run SoapUI tests as part of build and release processes in Azure DevOps Services (formely Visual Studio Team Services). 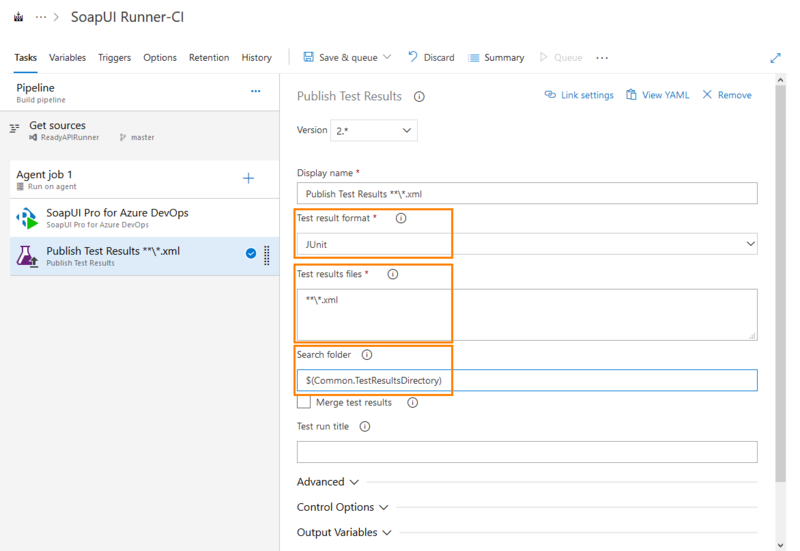 This way you will be able to include your SoapUI tests in your application lifecycle managed with Visual Studio testing tools. Use private agents to run SoapUI Pro tests. Running tests on hosted agents is not supported. The agent must be deployed on Windows computers. The extension cannot run tests by using agents deployed on macOS or Linux computers. The agent must have ReadyAPI installed. For detailed information on how to install ReadyAPI, see Install Information. You must have a SoapUI Pro license. You can use both the Fixed and Floating license to run SoapUI tests. We recommend that you use the Floating license: activate the license on the license server in your network and configure ReadyAPI on your agent to connect to the server. To learn how to activate ReadyAPI licenses, see License Activation. You must create a project in ReadyAPI and the agent must have access to it. Typically, you store your project in a source control system (like Git or Team Foundation Version Control) and then configure your build to get the project from source control and place it in the needed folder on the computer where tests will run. In the Path to SoapUI Pro Project text box, specify the path to your ReadyAPI project. By default, the task runs test by using the most recent version of ReadyAPI installed on an agent. If you need to specify a particular version of TestRunner, specify fully- quialified path to the Path to TestRunner text box. In the Test Suite text box, enter a test suite to run. To run all the test suites in the project, leave the field blank. In the Test Case text box enter the test case to run. If you leave the field blank, the task will run all the test cases of the specified test suite, or, if you have not specified a test suite, all the test cases of your project. In the Password text box enter the encryption password. It is required if your project is encrypted. In the Environment text box enter the environment configuration that the task will use for the test run. Add the Publish Test Results task to your build definition. In the Test result format drop-down list, select JUnit. In the Test results files text box, specify the masks to be used to search for the test results files. In the Search Folder text box, specify the folder in which your ReadyAPI test results are stored. To merge several reports into a single test result, select the Merge test results check box. In the Test run title text box, enter the name of the test run that will be assigned to the test results. This name will be used in the test run statistics (you can view it in the Test hub). You can find more information on how to work with ReadyAPI from Azure DevOps in ReadyAPI documentation.